There’s this polarity between creative people and business people. You’re either creative, or you understand business. One or the other. That’s what the world would have you believe anyway. It’s hard enough that the corporate world takes advantage of artists because most of us love what we do, but then artists themselves perpetuate the same garbage! Artists themselves buy into the lie and tear down other artists. It’s terrible. If you ever begin to sell or profit from your artist, you end up getting hate from other artists because “you’re a sell out.” What they don’t realize is they’re holding themselves back too by devaluing everyone’s work. It’s crab mentality. That’s where you have crabs in a bucket that one could totally escape from if it weren’t for the other crabs pulling him back down. They don’t want you to escape the bucket of mediocrity! I get really fiery about this topic. Ben does too because he hates the “starving artist” myth. I’m really passionate about this because it’s the reason I do what I do. I’m putting my neck out there every day, and I sincerely appreciate the people who are supportive of this show, but you would not believe the kinds of things people send and say! I have to remember that I’m not doing it for them. I’m doing this for you. It’s just something that comes with the territory. But here’s the reality: at the end of the day, artists who wield business will win. We talk about how to do that in today’s episode. Artists should understand the selling power of their work—the designers are the ones creating desire. It’s easier to tear others down than it is to live with the reality of your own failure. People only take advantage of you if you let them. If you do what you love and protect it, your problem won’t be monetizing, but managing money as it comes in. As an artist, you are creating value and that should be compensated. Be epically good at your art and be epically savvy at business. Some artists want to do their art but don’t understand the hard work that goes into making it profitable. People will get upset when you talk about the real numbers of your success, but they’re not your audience. To focus on growing the business might mean shifting focus off the art. Use your business mindset to create the bounds within which your creative self is able to operate. 04:12 Ben: This topic represents a very unhealthy construct that has been created by society. A lot of people accept this construct as reality or even defend it as their identity. It’s not good for them or others, and I would love to add my voice to a movement that stops this false identity and allows the beauty inside us to reach the world the way it’s supposed to. 05:03 Sean: I’m seeing two thing happening. First, artists and the art they create is inherently valuable; the work they do is important. Secondly, the world respects money. Cash rules everything around me. One issue here is seeing art as unimportant if it isn’t monetarily profitable, and another is the polarity between artists and business people. You’re either a creative person or you understand business—that’s how the world wants you to think. 06:16 Ben: It’s even more complicated than that. Sometimes, artists defend their distaste for thinking about money and business because they don’t care to see the utility in art. They alienate themselves from that group. 07:21 Sean: This causes problems, like the situation with the music industry and record labels. The record companies make 90% or more of the profits, and yes, they’re doing a lot of the work, but it’s as if artists are no good unless they join up with someone who gets business. 07:57 Ben: Not everybody shares that idea, but it’s a prominent one. Business people are business people and artists are artists. If you want to succeed as an artist and make your mark, you have to rely on business-minded people. That puts business people in the position of feeling like they have to stick to their niche and let the artists do their thing. It’s an unfair categorization; people are putting themselves in that box. 08:37 Sean: You get so upset about this starving artist mindset because the artists themselves perpetuate it. They’re self-deprecating and it’s a crab mentality with other artists, too. They’ve owned it. It’s as if you’re corrupt if you make it, profit from your work, or run a successful business. If you do those things, you’re a bad person and you’re not being pure in your art. 09:18 Ben: You’re a “sell out.” It’s not just that artists have surrendered or feel defeated by this definition, but it’s become so prominent that people actually defend it. They’re proud of being a starving artist and they’re not going to let money determine what kind of art they do. I understand wanting artistic expression to be a gift, something you generously put out into the world, but being generous doesn’t mean that you don’t also meet your needs. 10:03 Artists talk about wanting to be pure, but because of the limitations in their finances, it keeps them from being able to do what they would have been able to do in a better financial situation. When you’re smart with the business side of your art, you have a greater ability to make an impact in the world. 10:32 You’ve got more freedom. You can free up more time for yourself to hone your skills because you can afford to. There’s this myth in the economy of artistry that there are limited resources and everybody is fighting over the same coin. There’s an abundance, and the abundance is created by people who give generously of themselves, are smart about giving that back, and put themselves in a position to continue to do that. 11:22 Sean: That’s where the selling power lies. Say you’ve got a company that makes plain metal or tin lunch boxes. No kid wants that; that’s not fun. Plain shiny silver lunch boxes don’t sell; the ones that sell have bright colors, cool designs, and recognizable characters. The artists hold that selling power. The designers are the ones creating desire. People crave something that’s beautiful and well designed. 12:03 The artist has that power, but the corporate world doesn’t want you to recognize that. They’re able to take advantage because artists enjoy what they do. Everyone else has this compartmentalization of work and life. They’re glad they don’t work for themselves because they like getting off their job and being done thinking about work. It’s not in the back of their mind anymore. 12:33 They don’t fully understand, because when you do what you love and start with the passion, and you protect the passion from the beginning and allow it to grow into this beautiful thing, what you do is what you love. It fulfills you. You enjoy waking up every day and doing your work; it’s as if someone just put money in your bank account, you woke up, and thought, “What do I want to do? Do I want to play piano, draw some pictures, help someone with their fitness, or take photos?” If you could do whatever you want, that would be the best day ever. 14:10 Ben: I don’t want people to think, “If I’m going to be an artist who’s not a starving artist, I need to start selling my stuff right away.” Merinda asked in the chat, “Why do you have to be a starving artist when you have no interest in monetizing what you create? Why can’t they just say, ‘This is my hobby,’ and then have a day job or whatever?” That’s fine; that’s protecting your passion. When you have a day job and you’re able to do your art on the side as a hobby you have this freedom in expressing your art. If you start sharing it even a little bit, because it’s your original, unhindered artistic expression, it ends up becoming profitable because it’s so attractive. 15:16 Now the question isn’t, “How do I monetize this?” it’s, “How do I manage the money people are wanting to pay me to do what I already love to do?” It’s not that simple, but that’s the mindset I want people to have. 15:53 Sean: Winston says, “At my university, graphic design was part of the overall art department. We were always looked down on and made fun of because we weren’t in that ‘pure artist’ mindset, but the graphic design concentration was what was keeping the art department afloat, so it was a double standard.” It is totally a double standard. 16:20 Robert says, “Selling out equals compromising your values due to Scarcity Mindset. It’s not selling out to be compensated for your work.” As an artist, you are creating value and that should be compensated. You’re participating in commerce. More lunch boxes will sell because of your art. 16:56 I was contacted last week by a USB flash drive company; they want me to make designs to go on their flash drives. Flash drives are a commodity like lunch boxes, so what sells is making them look cool. In exchange for designing something for them, I was only going to get eight free flash drives. It’s absurd how presumptuous and exploitative these companies are. I don’t even give them the courtesy of responding because I get too upset. I get angry that they’re not just reaching out to me and other young designers and artists have to deal with this. They don’t understand. 18:13 I understand, because I spent a dedicated three months learning everything I could about licensing, art, design, contracts, terms, etc. I immersed myself and learned everything about it, all of the time frames, rates, break downs, zones, different countries, and usage rights. I got this really great book from 1997 that had such good principles. It was talking about the world wide web and CDs, but because the principles in it were so good, I was able to adapt pretty much everything they were talking about and some of the examples of contracts they had in there to the modern age, to the internet and how people advertise now. I came up with licensing contracts that are included in Learn Lettering 2.0. 19:30 I have been able to utilize that, and had I not educated myself, I would have been oblivious and these companies would have taken advantage of me. One company came and they said, “We want you to do this design for us. How much will it be?” I asked where they were going to use it and what it was for. They said that they were going to put it on greeting cards to sell. I gave them specific usage rights for a specific area for a certain amount of time at a certain rate, so that means they can sell my design on these cards in this country for this long and I get a certain amount of money. Not only that, but I also charged them for actually creating the design. People don’t know this stuff and they get taken advantage of. 21:14 Sean: If you hadn’t created it, you would have to create it and that’s something that takes work, which needs to be compensated. 22:48 Ben: We’re talking about products and commodities. Things that by themselves aren’t worth as much without the art, but there is inherent value in art itself because it adds beauty. It’s subjective; not everybody sees a single piece of art and agrees that it’s beautiful, but for somebody it is beautiful and adds value to life. Art adds beauty to the world. 23:15 For example, somebody purchases a painting and it hangs on a wall in their house. Every time they walk into their house they see that painting. Every time they have guests over, they see that painting. Even if it adds the smallest fraction of joy to their lives, that joy translates into other things that are profitable for them, like more focus or more fulfillment in the work they’re doing or in their family. 23:51 Sean: That touches on things we talk about in Value Based Pricing. A lot of times, value seems intangible. How do I come up with a value-based price for wedding photography? They’re not going to profit from those photos. You have to dig deeper and explore how different pieces affect each other. We lost our wedding photos. We hired someone with a barter; we were being cheap, and they lost the photos. 25:00 We didn’t even know they were lost for two years. They were stringing us along and we kept trying to get our photos. Finally, they told us they were lost. How much do you think it would be worth to my wife to get those photos back? What would she pay? That’s what we don’t think about. If you’re a professional photographer, you’re cringing right now because of how terrible and unprofessional this is. You have backups, assistants, multiple cameras, and you would have kept your client informed. 25:50 There are a lot of people looking at whether to hire someone who’s cheap or a professional. What’s the difference? They’re photos; you’re not going to make any money off of this. You’re thinking the same way if you’re thinking that your stuff only has sentimental or intangible value. What is the price of working with someone who’s not professional when it ends with you losing all of your wedding photos? What would you pay then? “Just” a painting on the wall could create joy for someone that translates into something else that has tangible value. 26:43 Ben: Laci felt sad when you found out that there weren’t wedding pictures, and you, being a non-emotional person, had to deal with those feelings. There’s a butterfly effect from that moment when there’s a depression in the collective feelings of the McCabe home. What if dealing with that emotional situation led to a reduction in revenue with the Learn Lettering launch, costing you an additional $40,000 or $50,000 that day? You can’t chase all those little trails. You can’t sit across from the person buying your painting and tell them that it’s going to bring them joy and subsequently make them more productive, but you also can’t deny that there’s inherent value there. You shouldn’t apologize or have to explain that to people, and you should charge what your art is really worth. Artists should understand the selling power of their work. 29:05 If they want someone to help with that, that’s fine, but you need to understand it well enough to know if you’re being well represented and, if you’re not, to be able to handle it on your own. 29:23 Ben: You also have to ask yourself, if you feel a distaste for business stuff, whether your distaste is a piece of an identity you’re living into because you feel like you have to because you’re an artist. Is this something you’re doing unnecessarily to yourself? Chances are, in order for you to be able to produce art like you do, you had to learn. You probably enjoyed the process of learning. You probably enjoy learning in general. When it comes to business, it might feel boring at first, like history class in high school. 30:15 I didn’t enjoy history class when I was in high school, but when my perspective shifted and I stopped saying, “I’m a person who doesn’t enjoy history,” I started seeing the value in it. It started to become fun for me to learn new things about it because there wasn’t any pressure to make a grade or turn in a paper; it was just about acquiring new information. If you have that kind of approach to business related things, it doesn’t mean you have to be an expert, but go with your instinct to learn new things. Even if it’s not directly applicable to your specific artistic field, it’s going to benefit you in some way in the long term. 31:17 Sean: I was indifferent to history; I wasn’t in love with it, but it wasn’t the worst thing either. History does repeat itself, so we’re doing ourselves a disservice if we’re not looking back at the records of people who dedicated their entire lives to learning things and building upon the things people before them learned. You only get one life, and you’re part of the way through yours right now. 31:54 Someone else has lived their entire life, a lifetime of learning things, and fortunately for you they’ve shared some of their learnings. It’s there for you to uncover. I’m not saying you have to go back and learn about history from the 1300s or 1400s, but there’s a lot of wisdom back there. You don’t have to go forward and only learn from your own mistakes, because there’s a lot of things people have done wrong before and they’ve written or taught about how it made them better or what they learned from that situation. You can repeat successes like that. People write books about their whole journey—“How I was able to do X,” or “How I learned to do Y.” You can take that and repurpose it for yourself. 32:57 Ben: In high school, the tests were all about memorizing the dates and names of events. The richness I found in history is being able to see the story of real live people. As artists, we’re more inclined to get our history in that form. We want to hear stories about people. Last night, I was watching a recent movie about Steve Jobs. There’s a moment where he’s raging against the idea that he might be a father when he’s in the middle of trying to build this monumental thing that became Apple Inc, and then there’s a shift where he’s reconciled with his child and is a father and a family man. 34:16 I see not only something that’s really refreshing that’s a part of my story and speaks to my values, but I also see something that goes against my values. When I think about business, it reminds me that my personal values can express themselves in business and I don’t have to be beholden to a system that others who have gone before me have established. It gives me the courage to forge new paths where people have fallen into the pattern of convention. Part of being business-savvy is knowing what you can say no to and what you should say yes to. 35:05 Sean: There’s plenty of people who talk about how they’ve been able to have success with discounts. That doesn’t mean I have to have discounts in my brand. If I want to have a higher, premium type brand that doesn’t discount or devalue products or services, I can do that. I can cherry-pick what I want from people in the past. Bringing it back to Brookes’ question about having someone else handle business stuff, when it comes to clients, you need to step it up and be professional. There shouldn’t be a liaison between you and the client—you need direct communication. 35:51 If things are getting filtered through someone else, responsibility is split and fragmented, you have a telephone game going on, and you need to be able to communicate directly with the client to figure out what problems you’re solving. The more you compartmentalize the artist and the business stuff, the more you’re fitting the stereotype of, “I’m an artist; I need to focus on my work. I can’t get caught up in all the business stuff or I’ll lose my muse.” You need to be both—be epically good at your art and be epically savvy at business. 36:41 Your artist friends are going to hate you, at least the ones that are going to bring you down, because when you’ve bought the lie, you’re going to tear others down. If they’re successful and they’re right, then you’ve messed up. The response is out of fear. If you’re succeeding, that means they’re failing. 37:16 When you decide you’re going to be an artist who understands the value of your work and that it has selling power—that you can be a business person and you aren’t forced to choose in some dichotomy—you’re going to upset people. What hurts is that it’s the people that are close to you, the other artists. They’re going to be upset that you’re making it. 37:52 Ben: There’s some value in the confines that come with being a business-focused person with your art. When you’re working with a client, even when you’re not solving a specific problem with something design related, there are deadlines and preferences. Even if they’ve come to you because of your specific style, they might want you to use your style in a specific way that brings them joy. You have to decide how much room you’re going to give for things like that. Resist the urge to say, “I can’t have a deadline because what if my muse needs the time to get this thing out?” You could be waiting forever. 38:51 The value in deadlines is that you have to work whether you feel like it or not, but when you reach the deadline, whether it’s as finished as you want it to be or not, you’ve got to put it out there. There’s an element of faith that comes into it when you put something out there like that. You showed up every day, you shipped your work when the deadline came, and you have to trust that the value and the beauty of it is going to be seen and experienced in the world regardless of how you personally feel about it. 40:35 I get people hating on me. They mock me on Twitter, dismiss me in person, and send hateful emails. They’ve bought the lie, and the only way to live with themselves in that is to tear anyone else down who threatens their reality. 40:58 Ben: It’s misplaced frustration and anger. I experience this with my kids sometimes. When circumstances in life don’t turn out the way I want them to and I feel a little bit out of control in other areas, sometimes, because my kids are the ones in front of me, I direct my feelings toward them. I should be pointing my anger and frustration toward more productive things. There’s this “us vs. them” thing, the artists and the business people. Part of the crab mentality is, “You don’t look like us anymore because you’re successful. Even though you’re creating beautiful art, you don’t belong with us because we all need to look the same.” The real source of the artists’ frustration is the system that created a definition that they took on for themselves. If they’re not fighting against that definition by being more business-minded and defending the value of their art, they’re pointing their frustration at the wrong thing. It’s easy to live in a world others have defined for you, what’s hard is breaking out. 42:29 Sean: “This is how designers are. This is how artists must be.” These are the constraints you have to live in. If you’re a musician, you have to go through the system, get a record label, abide by the rules, change your style when you’re told because it will sell more—you have to do what other people say. It’s easy to live in that world, what’s hard is to break out. 42:57 It’s hard to say, “No, my work has value. No, I’m going to take up my own business, control my own work, control the price it’s sold at, control the clients I take on, control how I distribute this, and control the quality of the production.” It’s hard to do that, but when you break out of the mold, everyone else that’s conforming to the system they complain about is going to be upset because you’re making them look bad. If you’re making it work, that means they could make it work, but they don’t want to do what it takes. The people who belittle you only matter if you care about what they think. 44:58 Break the mold, Tommy and Jenna. You either buy the lie or break the mold. Look at me and how I’ve built my business. I’m an artist, but look at what I’ve done with my business and my courses. Do you think anyone calls me a starving artist? No, they don’t. This didn’t happen overnight. I was doing this for four years every day, working really hard, and nobody cared. “Oh yeah, Sean runs his own business. Nobody knows what he does, he has fun drawing his letters.” That was what all my friends and family thought. 45:47 It was only once they saw the tip of this iceberg that was there the whole time that they said, “Wow, an artist makes six figures in three days! Stop the press, hold the headlines, this is crazy. This is insane and so strange. What a wonder.” It had been happening all along, but they didn’t care or get it. They only get it years down the line when they can see that you’re actually doing okay for yourself. Even then, they’ll see you as an anomaly. 46:33 Ben: It could be they’re not actively hating, but they just don’t have a box for that. They don’t have a box for an artist who’s professional and is doing their art for anything other than fun. There are people who have a box and the more consistently you do your art and the more you believe in it, the sooner you’ll find the people who have the right box for you. 47:09 Sean: Family doesn’t have a box for you. You have to work for four years until something surfaces they can see tangibly—money. All anyone understands is money—not investment, hard work, time, or showing up every day. We get it. You’re working hard. No one else sees the results yet, but they’re going to sees the results, and when it happens, your family’s going to be surprised because they didn’t understand all along what you were doing. They thought you were just playing, and they’re finally going to get it. 47:58 There will be haters. I’m not saying it will be your family. Someone in the chat said, “I don’t understand how anyone could hate on Sean,” and then Marinda said, “It’s not about Sean, it’s about them.” I have legitimately lost friendships. I worked really hard for years and finally, when I made substantial money, people turned a cold shoulder. Some people scoffed, some were silent, and some mocked me publicly. I lost friendships, people I’ve known for years. They quietly unfollowed me and we don’t talk anymore. It’s a shame. 48:52 I threaten them as artists with my success. “You’re not supposed to do that! You’re a crook, a salesman!” Another artist said, “You and your pyramid scheme,” to me. Number one, a pyramid scheme is something where you recruit others who recruit others who recruit others, and the last guy’s screwed. First of all, he doesn’t even understand business, but second of all, it’s just sad. This other artist thinks the only way you can make a living as an artist is if you’re illegitimate. Otherwise, you must have some sort of pyramid scheme. It’s crazy. 49:46 They haven’t spent the time to explore my world. They want the secrets. They click on the articles about how to make money as an artist, but they’re not really listening. People want the short path to success and they get offended when they hear about my success, but they won’t explore the depths of the value I offer. I share 100% of all my approaches, process, and tactics. I’m completely transparent. There are dozens upon dozens of videos and podcasts out there, and they could do it. They could do all of it if they took the time to consume what I spend 18 hours a day producing and spending my own money to create and help them for free. 51:00 Ben: The picture of the starving artist—”I’m not taking care of myself because I’m so devoted to my art,” or “I’m not making money because I’m so devoted to my art,”—that false identity doesn’t take into account that when you’re working hard outside of your normal business hours with a day job where you’re making money, pouring your sweat, blood, and tears into producing your art, there’s some sacrifice that goes into that. It’s hard work. From the outside, it might not look like you’re thriving. The fulfillment you get from working hard does let you thrive, and when you work hard, you see results. 52:09 It’s a self-fulfilling prophesy. They think, “I’m going to do my art and I’m going to have a hard life.” What looks a certain way on the outside really is somebody like yourself working hard and sacrificing. It’s like giving birth; there’s nothing beautiful or glamorous about birth. I’ve been in the room several times, and it’s a messy affair, but what comes from that is beautiful, amazing, and life-changing. To look at that beauty and say, “That was easy,” is completely inaccurate. The hard work and sacrifice that goes into it may look a certain way on the outside, but what it produces is beautiful and very valuable. 54:22 Ben: People look at folks like Jeff or artists who do something similar to what you do, Sean, but they look at your outward success and their own productivity, and they say, “If he’s doing the same things I’m doing, why is he experiencing this kind of success?” Or, in Jeff’s case, they’re looking at the kind of work each of them do, and they assume that because the kind of work Jeff does doesn’t seem profitable to them that he must be struggling. It’s a lack of looking deeper into what’s really going on. I love that in this show you really open that up a lot, Sean. 55:24 You have worked ridiculously hard to get to where you are today. To the starving artist out there who feels discouraged because he sees other people being successful and he’s not experiencing that, stop looking at what you think they’re doing and the results you think they’re efforts produced, and look at what you’re doing, the kind of effort you’re putting forth, and the kind of mindset you’re working from. That’s where you need to start and shift some things to get out of this starving artist mindset. 56:08 Sean: The reason I’m so passionate about this show is kind of the reason I’m doing all this stuff. I’m putting my neck out there, and I sincerely appreciate the people who are supportive of this show, but you would not believe the kind of things people send and say. I have to remember that I’m not doing it for them; it comes with the territory, it’s just a part of it. I was just having a conversation with a good friend who launched something recently and it did well. 56:56 He knows that I shared the details of the Learn Lettering launch, and he was asking me if he should share real numbers: “Is it a good marketing move to share the details, and are the types of people that sharing those details attracts worth having in my audience?” I said, “Forget the traffic. Forget the new people coming in. Forget that this could be a marketing tool. Why do you want to share? Who is this for?” If the answer is that it’s for the loyal followers who want to learn this stuff, share the value. Yes, you’re going to get the hate. It’s like my wife Laci has said before, “People want to know how to make money, but when you talk about real numbers, they don’t want to listen.” It’s the strangest thing. 58:01 The reason I do this, I stick my neck out there, and I take all this crap, is for you, the listener, because I believe in you and I believe you don’t have to live this lie. You can do something you enjoy and be supported by it. That’s why I’m doing this show. I’m doing it for you; I want you to believe it’s real. 58:29 The only thing people get is money. I can talk about principles all day long, but why should anyone listen to me or to you? That’s why I share real numbers; that’s why I’m transparent. I want to show you this is possible, not that it’s easy, but it’s possible. Show up every day, work really hard, and do things strategically, and don’t just say, “Do I want to be creative or do I want to be a business person?” Be both. I’m not saying if you can’t work 16 hours a day you won’t be successful, but put everything into it. What are you doing you could cut out? What are you doing that is taking up your time that you could get back and apply toward something you say you care about? 59:20 Ben: What some artists think is making their art so pure is actually keeping it from getting out into the world the way it should. Having an understanding of how business works and how it can help you share your art is what makes it more possible for people to see it and experience the beauty of it. Will Building My Business Limit My Art? 1:00:41 Yes, at first. To focus on growing the business might mean shifting focus off the art. That’s the reality; I’m not going to pretend like you can focus on a bunch of different things and do really well at all of them. You are going to have to go through seasons where you’re building up different pieces of this building that is your business. First, you have to focus on the foundation. Then you need to focus on the design and the structure, and then you have to actually build the thing and there’s the rooms, the roof, and the plumbing. There’s different parts you need to focus on one at a time. 1:01:20 You can’t just say, “I’m going to build this corner of the foundation, the room right above it, and put the toilet in this corner.” You have to focus on one thing at a time, and that means you’re going to take a focus shift off of the art for a period. That’s why I encourage others to have a sabbatical period on a regular basis, so they’re able to pursue secondary passions or things that are not within the primary season of focus—just to keep those things alive (Related: e072 Small Scale Sabbaticals). 1:01:57 Ben: You do learn a lot from experience, but the more you learn upfront about how business works, the more possible it can be to scale it at a pace that allows you to still be involved somewhat. It’s probably not going to be as much as you want, and you can’t always foresee the circumstances that might pull your focus back into the business. Learn as much as you can going into it so that all of your learning doesn’t have to come through experience. There’s an element of faith in focusing on business for a season. The ways in which you grow from focusing on business for a season will translate into your art and make it that much richer. 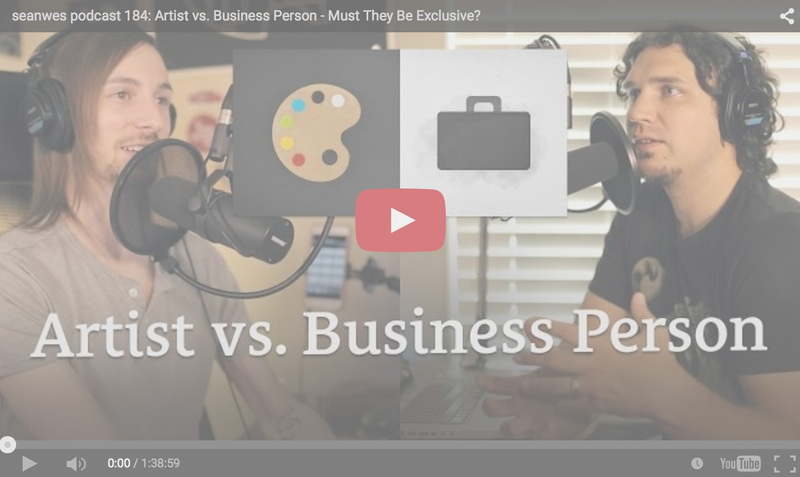 1:03:15 Sean: Kyle says, “Where’s the boundary between artistic personality and business professionalism? The artist tries to entertain and include humor, but the business person doesn’t want to seem unprofessional or unable to take things seriously.” You have to compartmentalize. Imagine if you did have someone handling all the business stuff. We talked earlier about why you probably don’t want to do that, but if you had someone representing you, imagine how they deal with your client. Are they goofing off and being silly, or are they getting business done? That’s the same way you want to conduct yourself. 1:03:54 Contrast the musician onstage who’s going crazy and doing their thing with the board room meetings between their agent and the record company and the streaming services; they’re probably not all going crazy like that because it’s business time. 1:04:44 Ben: Think about the way you relate to different people in your life. Around your friends you express one part of your personality; with your parents, you express a different part of your personality. By compartmentalizing, you’re not being untrue, you’re curating all of who you are. 1:05:01 If you were the complete, full version of yourself around everybody all the time, you would do yourself a disservice because you wouldn’t get to benefit from being around people who might find that off-putting. We open up just a part of ourselves that we feel matches the person we’re in the room with, and we can think about business that way. You’re expressing a narrower version of your personality, but it’s still your personality. It’s not taking on another persona, it’s recognizing that you have a professional side and you can express that to this group of people. 1:05:49 Sean: In my article, Professional Profanity, I wrote about people who intentionally bake profanity into their product name, their tweets, and it’s just how they conduct themselves. It’s one of the three: cheap, lazy, or foolish. It’s lazy in that there are so many better words that could articulate things. It’s cheap in that it’s trading class for crass. It’s foolish because you can say, “Everyone who’s offended by profanity are pansies and they need to get over themselves,” but they’re a potential customer. 1:06:47 Are you so enamored with with your curse words that you won’t filter that in the professional sense in the product name you put out that you’re going to ostracize all these people? They say, “I’m just being my true self man, don’t censor me. I know who I am.” Do you belch in your own home on your couch when you’re watching TV? Yes, you do, and you don’t care. When you’re at a professional dinner with people, you’re not just going to let one rip. Don’t tell me not to censor you—it’s just context, etiquette, and knowing where you are and how to behave in that context. There’s nothing wrong with compartmentalizing. You’re not being less of yourself; you’re understanding that right now it’s time for business and another time is time to perform, be creative, be an artist, and be free. How Can a Business Mindset Help My Art? 1:08:57 You can’t be creative without limitations. It sounds counter-intuitive, because you think that creativity equals freedom, but freedom is overwhelming. Not only is it a blank piece of paper, but you’re in a blank, endless white world. I want you to draw an amazing picture right now. You would feel like the whole white world is staring at you. How big do I make it? What do I use? Over here, you have just city blocks full of every pen you can imagine: go nuts. It’s overwhelming, and you don’t feel like you know what you’re doing. Creativity comes from constraints, limitations, and bounds. You can’t have out-of-the-box thinking without a box in the first place. 1:10:35 Ben: Some of the creativity comes into play when you know the rules and you break them anyway. It’s not breaking rules when there are no rules. The breaking of the rules is what makes it alarming, unique, and noteworthy. 1:11:17 Schedule your work out into the future. Instead of starting with a ton of projects at different random times where you’re having to switch back and forth from artist to business person to artist throughout the day, take on a few select projects and schedule them out so you have focused times. It’s really hard to suddenly start a new project today, then have to be the business person, then you have to go back into artist mindset and focus on this project you need to finish. 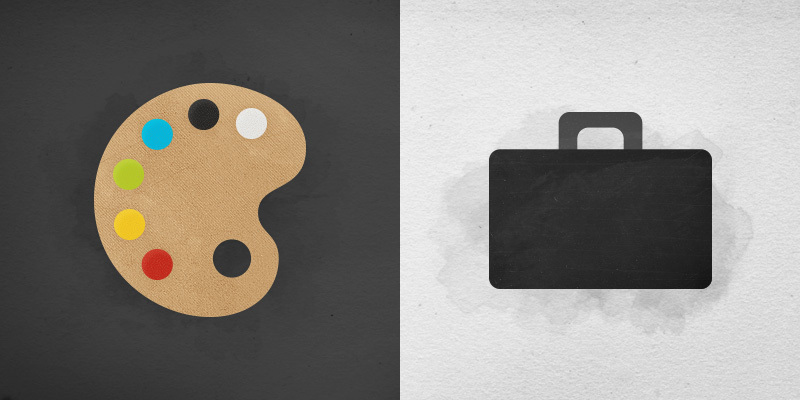 If you’re getting overwhelmed, you’re probably switching between art and business too much. Take a step back and schedule things a little more intentionally. 1:12:08 Ben: What if you wake up on an “art day” and you don’t feel like it? You feel like getting to the business stuff, that you have momentum there. Do you run with that momentum or do you force yourself into the rhythms and constraints you’ve created? 1:12:31 Sean: I’m all about running with momentum. Write when you have the inspiration. This is why you give yourself margin, not filling up your whole day. If you have a gap in your day, leave it, because you might get inspiration in that moment. If you have margin, you can shift things and write a blog post; it’s probably going to be your very best one, because it was the closest to your inspiration. If you want to speak and dictate and turn that into words on paper, do that. Don’t type if typing is the hardest way to start for you—go with the momentum.